The Neyland Carnival held on 13 July was absolutely great. The overcast patchy drizzle did nothing to dampen spirits as hundreds of spectators line d the route from the starting point of the Rose & Willow. It then proceeded down Honeyborough Road, Kensington Road, Riverside Avenue, Promenade, Hish Street and John Street to the Athgletic Club field. The floats and walking contestants put in so much effort; everything was of the highest quality. 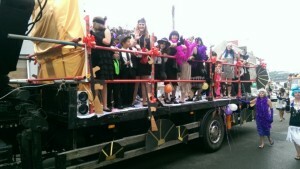 The best street went to Harbour Close with their take on the Roaring Twenties. Here are some of the pics of some of the entries. Huge thanks must go to Malcolm Hawkins and his small band of RAOB brothers for arranging the carnival and everyone agreed it was an outstanding success. The merriment lasted all day and there was no incident or disturbance of the slightest kind.